Dowsing is a type of divination employed in attempts to locate ground water, buried metals or ores, gemstones, oil, gravesites, and many other objects and materials, as well as so-called currents of earth radiation, without the use of scientific apparatus. Dowsing is also known as divining (especially in reference to interpretation of results), doodlebugging (in the US), or (when searching specifically for water) water finding or water witching. A Y- or L-shaped twig or rod, called a dowsing rod, divining rod (Latin: virgula divina or baculus divinatorius) or witching rod is sometimes used during dowsing, although some dowsers use other equipment or no equipment at all. Dowsing as practiced today may have originated in Germany during the 15th century, when it was used to find metals. As early as 1518 Martin Luther listed dowsing for metals as an act that broke the first commandment (i.e., as occultism). The 1550 edition of Sebastian Münster's Cosmographia contains a woodcut of a dowser with forked rod in hand walking over a cutaway image of a mining operation. The rod is labelled "Virgula Divina – Glück rüt" (Latin: divine rod; German "Wünschelrute": fortune rod or stick), but there is no text accompanying the woodcut. By 1556 Georgius Agricola's treatment of mining and smelting of ore, De Re Metallica, included a detailed description of dowsing for metal ore. The use of divining rods was a popular branch of folk magic in early 19th century New England. The early leaders in Mormonism, a religion that erupted out of that environment, were not exempt. 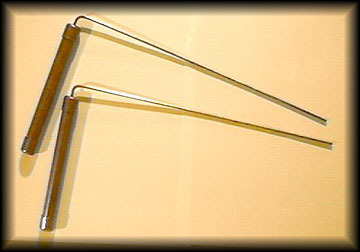 Oliver Cowdery, the Book of Mormon scribe and "Second Elder" of the Church, used a divining rod for revelatory purposes In a revelation given to Joseph Smith through his seer stone, God affirmed Cowdery's use of "working with the rod", and said that it was a divine gift through which Cowdery could learn the "mysteries of God". This gift later became known in the revelation as "the gift of Aaron", referencing Moses' brother Aaron's use of a rod in the Old Testament. In the late 1960s during the Vietnam War, some United States Marines used dowsing to attempt to locate weapons and tunnels. An extensive book on the history of dowsing was published by Christopher Bird in 1979 under the title of The Divining Hand. James Randi’s 1982 book Flim-Flam! devotes 19 pages to comprehensive double-blind tests done in Italy which yielded results no better than chance.